If the hinges on your garage door have grown old and worn out, or are making squeaking sounds when the door opens or closes, you may need to replace your hinges. The task is fairly simple but requires a basic understanding of the way garage door hinges work and how to properly remove and re-install them to succeed. Anytime you are working on your garage door, best practice is to work with the door in an “up” position in order to reduce spring tension and prevent injury. If you would like to work on your door in the lowered position, be sure to raise it first, disconnect the springs, and lower it again, raising to reconnect the springs when finished. To stabilize your door in an upright position, install C-clamps below the bottom rollers onto garage door tracks. You can also wedge a long wooden board to keep the door in an upright position, but clamps are easier to use and safer. During the hinge removal process, panels may sag. A ladder, well-placed board, or the help of a friend can all brace the panels while you unbolt the hinge. Choose whichever method works best for you, and be sure to clamp the support boards to the ladder in order to keep them from slipping as you work. Now you’re ready to remove the hinge. Loosen the nuts from the hinge bolts and tap the hinge bolts out with a hammer to release. You can leave the nut on the bolt unscrewed to avoid damaging the bolt threads or use a small piece of wood to protect these threads as well. Next, tip the hinge outward from the door, which disengages the roller from the track. This process is reversed when installing a new roller. When replacing an old hinge, your best practice is to replace the roller as well, unless it is brand new. Slide the roller into the proper hole, tip the roller back on the track, and line up the hinge over the bolt holes. Next, tap the bolts through the outside hinge holes and tighten the nuts. Put the roller axle over the same hole used in the original hinge. A note about shopping for hinges: Don’t throw out your old hinge just yet! Instead, take it along with you when shopping for a new one. This can make the comparison a breeze and allow you to find the closest fit to your old hinge. 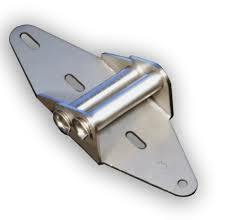 Replacing your old garage door hinge is fairly simple. However, every project has its issues, so if you find yourself unsure of the process or needing a little extra encouragement, call our experts at Ponderosa Garage Doors! We’d be glad to answer any and all questions you may have.